Mobile Broadband: Including WiMAX and LTE provides an overview of IP-OFDMA technology, commencing with cellular and IP technology for the uninitiated while providing a foundation for OFDMA theory and emerging technologies, such as WiMAX, LTE, and beyond. Throughout the book the author also discusses several wireless standards based on OFDMA such as UMB, IEEE 802.16j (Mobile Multihop Relay) and 802.16m (Gigabit WiMAX), IEEE 802.20 (MBWA), and IEEE 802.22 (Cognitive Radio). 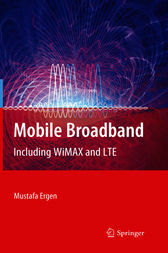 The book brings a good balance of theory, technology and practice of mobile broadband.